One week a month, Watch This offers television recommendations inspired by the week’s new releases or premieres. This week: In honor of the return of Fox’s Wayward Pines, our favorite episodes about weird towns. One of the most reliable sources of entertainment on Supernatural, especially in the early seasons, came from the disparity in knowledge between its two heroes and the everyday folks they interact with on a weekly basis. Sam and Dean Winchester, brothers who spend their lives fighting the monsters, demons, and otherworldly spirits of the Earth, are in possession of a vast wealth of information to which the majority of people aren’t privy. When they’d save someone from being eaten by a werewolf, or murdered by a vengeful ghost, a steady source of humor was the contrast between the average person’s bug-eyed response and the Winchesters’ lackadaisical “all in a day’s work” attitude. 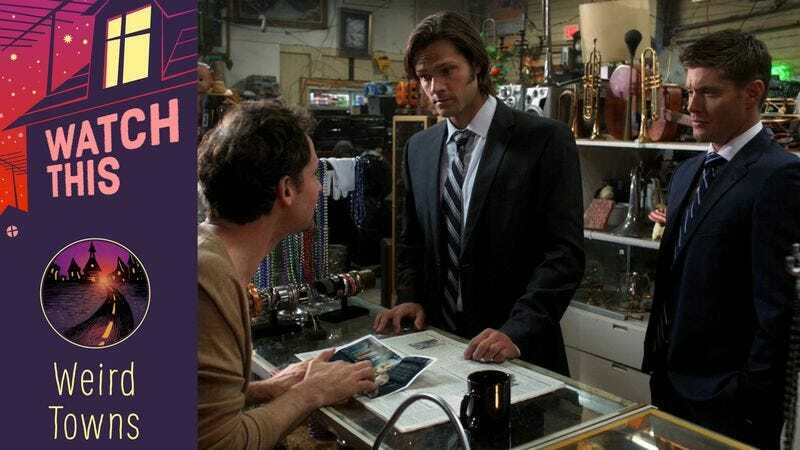 Which is why it’s such a treat to see “The Mentalists,” an episode where Sam and Dean investigate a strange murder in Lily Dale, New York, a tourist trap of a town where the majority of the residents are professional psychics. Fake psychics, sure, but psychics nonetheless. The plot finds the brothers temporarily estranged, thanks to some earlier murderous tendencies on Dean’s part. But, when each one individually hears of the strange deaths of two mediums in the town, they both arrive, ready to investigate, and inevitably team up to tackle the case. The two psychics—one killed by her own crystal ball, the other stabbed by her Ouija planchette—were both wearing the same necklace, which sets the brothers on a confrontation with the vengeful being responsible. The fun comes from inverting the usual formula of magic-aware hunters dealing with clueless non-believers, instead placing them amid a citizenry that treats magic as its day job. And while sure, they’re technically frauds (well, most of them, anyway), the devotion to proclaiming the existence of spirits, spooks, and all manner of magical abilities on the part of everyone Sam and Dean interact with is an ideal way to ruffle the usually nonplussed feathers of the squabbling siblings. It’s not just that the whole town talks a big game about the supernatural; it’s that they’re full of crap, and thus, when confronted with a pair of guys who actually fight the real deal, they just nod along as though they were in on the bit. Dean comes close to literally gnashing his teeth a few times, and exasperated Jensen Ackles might be the best Jensen Ackles. As they must, the guys eventually make peace with one another, and Sam rejoins Dean in the latter’s stolen Dodge Challenger. There’s a red herring of an evil spirit, some brutal ghost-on-person violence, and some last-second derring-do that saves the day. But all that is par for the bloody course on Supernatural. The treat is pushing the Winchesters out of their element, a recurring theme on many of the show’s better installments. It may be true that, in the land of the blind, the one-eyed man is king; but in the town of the fake mystical, the authentically occultish are just part of the furniture. Availability: “The Mentalists” is available on DVD and for digital purchase.